Arriving at the gym a tad later than normal on Monday(because of a quick run to Walmart), I immediately went over to two of my friends to say "Hi" and chat for a bit. During the conversation, Diane mentioned a deal at Ocean State...30% off Mon, Tues, Wed this week for senior citizens! Hmmmmm, I thought. I'll have to remember to tell the Pres about that when I get home. Okay, fast forward through my workout and an early lunch. The Pres and I had been shopping around for one of those gazebos with the canvas roof and mosquito netting to put on the new 12 x 16 deck. Well, long story short. Ocean State - 12 x 10 @ $ 199.00 MINUS 30% = $ 138.00....BIGGER, BETTER, CHEAPER!!!!! Thanks ladies for the friendly tip!! I love that screened cover! When Max and I were sitting out with out coffee one morning, I mentioned to him that one of those types of things would be lovely. I could even nap in the shade....won't now because of the possibility of snakes or wasps....I may check into them. great bargain, can't beat that and it looks like a nice one. 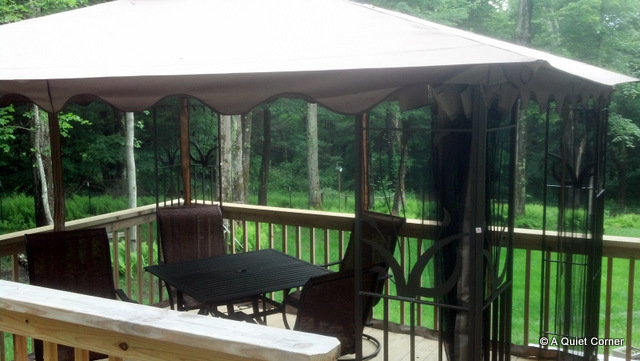 A couple years ago I bought one of those 10 x 10 easy fold gazebos. I told my husband I wanted to put it up on the deck and he said it would look stupid. I said I didn't care so we put it up. Not only did we love having it there but we noticed a couple of the neighbors followed suit. yay! gotta love a bargain that's better than the original find!